Lots of people think that all lawyers do all day is talk. It’s a a common misconception. Perhaps, there are some lawyers who spend their entire days talking; but not me. The majority of my day is spent listening. I listen to Judges. I listen to Masters. I listen to other lawyers. I listen to insurance adjusters. But, most importantly, I listen to my clients and to prospective clients telling me their stories. Every day I’m told from my clients how they’re struggling managing their pain; how they’re struggling making ends meet; how they’re feeling down and sad since their accident; and how their accident has turned their life upsidown. Accident victims have lots to say about their case, how it happened, and what their injuries are. Their testimony is important, and can be very persuasive to insurers, judges and juries. But, sometimes, the MOST PERSUASIVE evidence isn’t verbal; it’s written and hidden in the scribbles. What do I mean by that? Read on and find out. 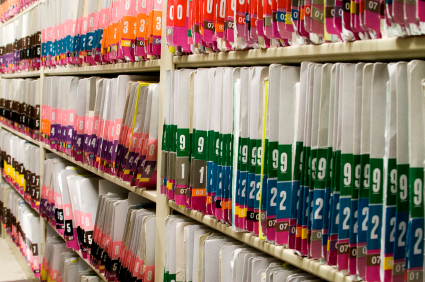 Judges LOVE medical records and medical reports. Sometimes, they’d prefer to sift through written records, rather than let the doctor ramble on with testimony. The medical records for any personal injury case provide your best evidence towards establishing your claim. In my experience, doctors might tell you something different than they actually write in their records. OR, you might hear it differently, or misinterpret what they’re saying. If that’s the case, you might get a wrong impression of what your injuries are, and what you relay to other people when discussing your injuries. These medical records are very important because they provide a detailed history of each of your medical visits to the doctor, what was said and what was done. It can take anywhere from 3-7 years for a common car accident case to go to trial. With that passage of time, it’s very unlikely that a doctor will be able to recall a specific visit, with a specific patient of a specific date. That’s why that during the trial, the doctor will be able to look at his/her clinical notes and records to refresh their memory. Let’s assume that following a visit to your family doctor, you believe that he told you that as a result of your car accident that you sustained a herniated disc. That visit to the doctor took place on January 3, 2009. You then go around telling everyone, including your lawyers, treatment providers and the lawyers for the insurance company that you’ve sustained a herniated disc. Upon review of the medical records, neither the X-Ray nor the MRI show that you sustained a herniated disc. What your doctor told you is that you MAY have sustained a herniated disc, and that this needed to be further explored. The reality was that there was a miscommunication between you and your doctor, which gave you a false understanding of your medical condition. Before trial, the insurance company will carefully review the medical records which your doctor has provided and see that nowhere in these medical records does it suggest that you sustained a herniated disc. Accordingly, their view of your case will be much different than your view. At trial, your doctor will be supeonaed as a witness. On the stand, he will rely on his medical records to refresh his memory. His medical records will not show any indication of a herniated disc. Therefore, he probably won’t mention it, and won’t be able to prove that you’ve sustained one. This will dramatically impact your case for the worse as proving this injury has now become even more challenging. It’s important to keep in mind that in the practice of law, saying one thing is cheap. Showing it. Proving it through fact based evidence is king. Fact based evidence in all personal injury cases usually comes down to the medical records and reports of your doctors. If their notes don’t support your injury, then your case isn’t going anywhere. This is yet another reason why it’s important that you not only have a treating family doctor, but that your family doctor be supportive of your injuries and treatment. Imagine getting your family doctor up on the stand and the doctor proclaiming in open court that he thinks that you’re a liar, a cheater and a malingerer. That wouldn’t be very good and would be humiliating. I realize that in some rural communities, that finding a family doctor is difficult to do. If you can’t find a family doctor, then visit a local walk-in clinic or attend at your local emergency centre or hospital. Some Nurse Practitioners can also be of assistance in providing pain management and treatment. They tend to work with other doctors. Although they cannot prescribe medication, they can help point you in the right direction to make sure that you get the care and treatment which you deserve. I think that’s enough law for today. Let’s talk about more pressing matters, like how Toronto’s basketball team is in first in the Atlantic Division!?!?!? In a year where nearly every team is trying desperately to get more ping pong balls in the draft, Toronto, instead decides to start winning. Even when this team tries to lose, it can’t even get that right. Finsihing 6-8th isn’t going to do Toronto any good in the long run. I have a hard time cherring this team on; particularly when they’re playing teams with talent which does not exceed that of my former Bnai Brith “B” Division Basketball Team.